Hey everyone! My name is Christina Faraj, I am a set modeler and set dresser at Pixar! I always loved creating environments that are immersive and feel lived in, aged, or any range of emotions that help support the character and story. To help me do so, I have a trained eye for fine details because I know that in those smallest details the biggest stories are told. 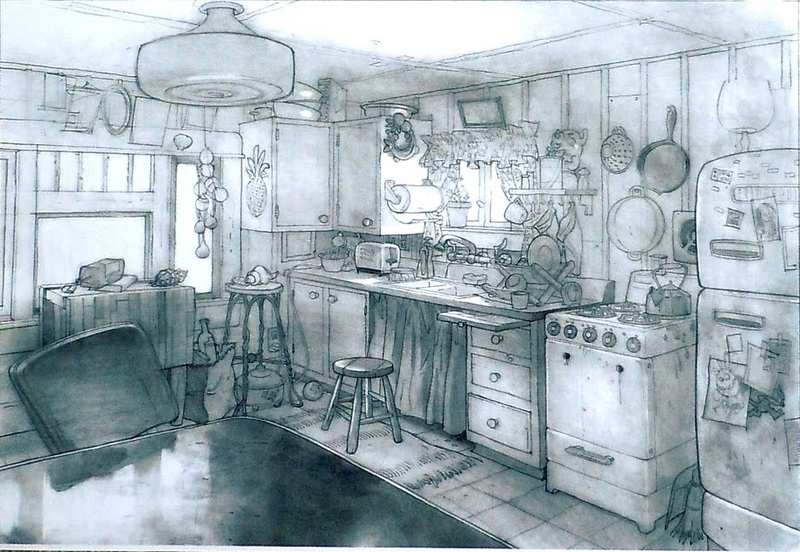 This helped tell my own stories, especially during my final project at PUP in the summer of 2015, where I chose this great kitchen concept by Paul Felix and added my own spin to it! Photo Reference Photographs Copyright Paul Felix. I hope you all enjoy look developing this scene, good luck! Since 2008, Pixar has invited a few promising undergraduate technical artists to intern at Pixar as part of the Pixar Technical Undergraduate Program, otherwise known as "PUP." These PUP interns, or "PUPs" spend the summer learning Pixar's pipeline, from people working in production, getting to know both the tools and philosophies Pixar uses to make animated feature films.